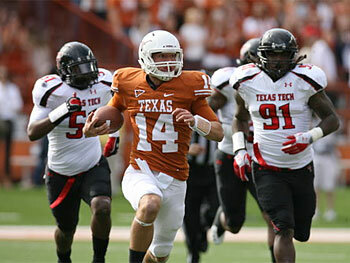 Video of player introductions of the 2012 Texas seniors before the game against TCU. Nice getting to hear from each of the players’ parents. WTH?! (What the Heck?) moments are attempts to find the memorable and the off-beat perspective on Longhorns sports. 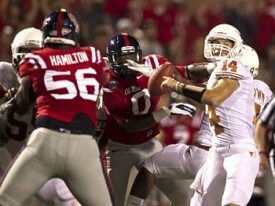 Here are some interesting moments from the Texas’ game against the Rebels. Pre-Game (15:00) WTH Hotty Toddy?! Wonder if Kenny Vaccaro liked this loud cheer? “Hotty Toddy, Gosh Almighty, Who The Hell Are We, Hey! Flim Flam, Bim Bam. Ole Miss By Damn!” Some of the 61,797 fans threw their toddy’s from the stands at the Longhorn players. 1st Quarter (9:41) WTH Edmond?! The first of three interceptions that the Horns collected as this INT went for a TD for LB Steve Edmond. Not too many other bright spots for the defense this game. 2nd Quarter (13:35) WTH Semper Fi?! The always Faithful Marquise Goodwin can be relied upon to make the big play. Marquise took a jet sweep 69 yards to the delight of a Marine in the end zone. Halftime WTH Chicken?! If you’re going to be a “streaker” you need to be more committed like the hog (bacon). A man wearing boxers ran right to the middle of the SEC logo and mooned the crowd before getting tackled by the popo. Guess this fan doesn’t like the SEC either. 3rd Quarter (10:39) WTH Starving?! The feed WR Donte Moncrief t-shirts in the stands were spot on. Seven catches for 144 yards with a 75 yard touchdown when this Rebel out dueled Carrington Byndom. 3rd Quarter (2:30) WTH Short Arm?! David Ash said “I think I mastered the underthrow.” His 46 yard shot put gave Mike Davis the chance to make a play on the ball for a TD that helped the Horns reach half a hundred. Wonder if this is the new version of the back shoulder throw that is done in the NFL. 3rd Quarter (:00) WTH Color Blind?! ESPN announcer Mark Jones said that nothing matches with burnt orange as the quarter ended. Mark forgot that everything goes good with that color when the Longhorns put up over 676 yards which ties for the second best yardage total all time. 4th Quarter (11:27) WTH Karate Kid?! A career game for David Ash while wearing his signature Ralph Macchio headband. He threw for 326 yards and four touchdowns which included the last TD throw to Marquise Goodwin for 55 yards and the final tally 66-31. Next up for the Longhorns is a bye week before going to play the Cowboys in Stillwater on September 29th. WTH?! (What the Heck?) 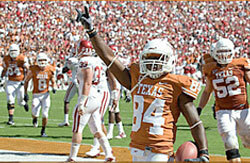 moments are attempts to find the memorable and the off-beat perspective on Longhorns sports. Here are some interesting moments from the Texas’ game against the BYU Cougars. Malcolm Brown rushed for 68 yards against BYU. Pregame WTH Hospitality?! I was enjoying some tailgating on campus when some BYU faithful came strolling by. Offered up to the group some cold beers and they refused our Texas hospitality. Oh yeah, Mormons do not like the demon water. So I gave them some of our own demon water, an H2Orange water bottle. 1st Quarter (15:00) WTH Cable Wars?! ESPN and Time Warner are battling it out over the broadcasting of the LHN. Interesting how the Texas athletic department is OK taking ad revenue along the stadium stands. There were Time Warner Cable banners all across the stadium while ESPN is broadcasting the game. 1st Quarter (1:54) WTH Grape?! This may be my last reference to Garrett Gilbert. The last image maybe of him throwing into double coverage where the BYU safety easily picked off the throw. He constantly locks his eyes on one receiver and makes poor decisions. I really hope he can fix the mental issues of his game. He may need to fix it while on another team’s roster. 3rd Quarter (12:45) WTH Hockey?! I have seen more shift changes in this football game than in the NHL. David Ash for one play and then comes Case McCoy. Great block delivered by David to help the running game get the team back into the game 13-10. Is it me or does David look like Sam Bradford when he has his helmet on? 3rd Quarter (4:26) WTH Marquise?! It is great to see Marquise Goodwin back to help out this team of struggling wide receivers. But you cannot get tripped up on your electrifying return of 40 yards by the BYU kicker. Marquise came back because he missed the team camaraderie. Well get ready for some ribbing in the film room this week. 4th Quarter (11:18) WTH Roommates?! Case hooks up with Jaxon Shipley on consecutive 1st down throws. 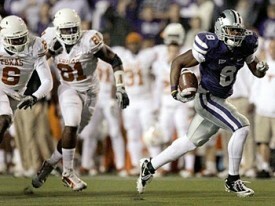 Jaxon hurdles one defender on the first throw and snags the next pass play one handed to bring DKR fans to its feet. The momentum of these two plays carries the Horns on to take the lead for good. Did you know that Case and Jaxon are roommates? Here we go again and I am starting to like it. 4th Quarter (3:39) WTH Diggs?! This call out should be for the entire defense on how great their play was on the field especially giving up only 67 total yards in the second half. Cornerback Quandre Diggs interception was the momentum shifter that the defense needed until we saw the closer. 4th Quarter (2:44) WTH Harsin?! The Lone Star State is starting to warm up to the Boise State offense when you see a freshmen wide receiver, Shipley, throwing a pass to another freshmen quarterback, Ash, to move the chains. New Kids on the Block should be replacing this year’s slogan of Brick by Brick. 4th Quarter (1:34) WTH Closer?! I would like to introduce the newest nickname to one of our stable of running backs who we will now affectionately call The Closer. Malcolm Brown running off left tackle for 14 yards sealed the win for the Horns and will hopefully garner more than the 14 carries next game. Next up for the Longhorns are the Bruins as they travel to LA for the game at 2:30pm on Sept. 17th. Start of the Game (15:00) WTH Little Apple?! A whopping 46,734 fans is the most intimidating place in the conference for UT? Seeing the Horns walk down the curved ramp, did they have to go through a turnstile to get onto the field. It’s still hard to believe a team from Manhattan Kansas has such a stranglehold on this team. 1st Quarter (14:07) WTH Defense?! The entire defense needs to be called out giving up such a quick score. It is also disturbing when a backup QB Collin Klein racks up a team high 151 yards of rushing and only 9 yards of passing. You know the run is coming and you cannot stop it?! 1st Quarter (9:28) WTH Mack 1?! I need to call out the gambler who has been quite successful on calling 4th down plays. The Wildcats have one of the worst rushing defenses in the country so the decision is to run a trick play which calls for a 5 yard snap back to the kicker in order to just gain one yard on 4th down. 2nd Quarter (6:52) WTH Mack 2?! Are you trying to tell me that you designed exotics (trick plays) for punter Justin Tucker, but did not have one single play call designed for DJ Monroe. It’s amazing that you try gaining 10 yards by starting off with a reverse which gives way to an option to only get 7 yards. To add insult to injury, the team had a holding penalty that would have wiped out anything remotely positive on that play. 2nd Quarter (3:14) WTH Trey?! I know that you are just a freshman, but Trey Hopkins will have to serve as the poster boy for the failures of the offense line. The biggest pass play of the night (a TD) to James Kirkendoll was wiped out by your holding penalty. ESPN cameras throughout the night captured the UT fans in all of their anguish and disgust. 2nd Quarter (:20) WTH Grape?! One of the many hardships that follow Gilbert Grape (I mean Garrett) is the desire to force a throw. With the Horns on the doorstep of ending its sour first half, Gilbert launches an ill advised pass to the K-State defender Ty Zimmerman in the end zone. Grape will end up dishing out 5 INT’s without a hint of sitting him down to let him clear his head. I hope the coaches were right for leaving him in there for his sake. 3rd Quarter (1:19) WTH Goodwin?! I know that are special teams are not even close to being special. But Marquise Goodwin did not even look like he knew what he was doing when he plowed into the punter to extend K-States drive for their final touchdown of the night. Who is our special team coach!? Mike Tolleson? The same coach that takes care of the defensive tackles needs to work on both job titles this week. Next up for the Longhorn’s are the Cowboys of Oklahoma State in Austin on November 13th. Thanks for following my WTH articles throughout the season. I appreciate the opportunity to rant about the greatest University sports program in the country. You can continue to follow comments on all of UT sports on twitter at 40AcresSports or follow me at Horns1991. Log on to flavortouchdown.com to enter for a chance to win the Sonic Flavor Touchdown Sweepstakes. You could win a prize package and a VIP football trip for 6 to the bowl game of your choice. Hopefully the Longhorns win at least two more games this season and make it to one of them. HOOK EM! !